Google Nexus 6P RMA – upgrade to Pixel XL for free? A link to GSM Arena article got shared with me today. Apparently, some users are getting their Google Nexus 6P RMA and upgraded to a Google Pixel XL phone. I discussed my RMA process (successful) here – take a look if you have any issues with your Google Nexus 6P. The report mentioned phones purchased through Google Store directly by users from USA and Canada, however, the UK also have ‘some’ success rate in this regard. The poor Google Nexus 6P has been affected first by the battery issue, then a boot-loop. As the fault has been confirmed to be a hardware related (but does not affect every device) it is also mentioned that phones out of warranty have been handled by the Google Nexus 6P RMA process. If you own Google Nexus 6P you may want to look closer into the reports and check if you could qualify for the upgrade. I was lucky enough to get my phone fixed and the battery issue never troubled me again. 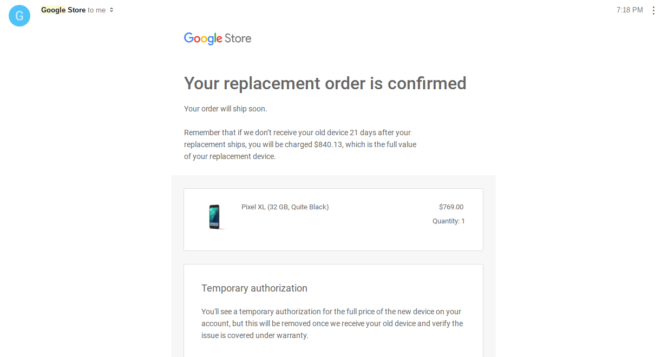 I also upgraded to Pixel few months after as I was out of my contract. Whatever your case maybe, if you can swing yourself a brand new Pixel XL thanks to that – it may be worth a shot. If you now sure how to start the Google Nexus 6P RMA – take a look at my post. Let me know if you are successful I’d like to hear the story from someone that got their phone exchanged.